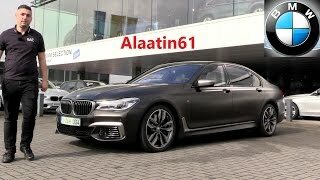 BMW M760Li xDrive 2017 is the luxury ground –bound missile based on sixth generation & series. With the superb velocity it walks and talks like an M7. It’s the powerful model of the superior brand BMW. The model delivers the world class style and comfort which it great to experience. 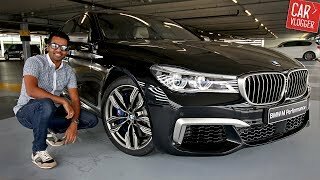 Let us have a close look at the reviews of the classy and awesome model BMW M760Li xDrive 2017 is get to know about the stuffs and gestures it contains. BMW M760Li xDrive 2017 offers the luxurious interior. The abundant amenities include top-shelf wood, high-gloss metal, and creamy leather. There are Brushed-aluminum door sills illuminated with “V12”. Drivers will enjoy piano black trim around the selector lever and iDrive Controller on the center tunnel, also sporting the ubiquitous “V12” logo. There is a new M-branded steering wheel is wrapped in leather and gets multifunction buttons set in Pearl Gloss Chrome inlays. The pedals are made from stainless steel and get rubber inserts for slip-free inputs. In addition it provides with iDrive 5.0 infotainment operating system ties together all the gizmos, offering both a touchscreen and traditional physical buttons. There is also a standard next-gen heads-up display, displaying info like road speed, speed limits, system messages, navigation, and infotainment menus onto the windshield, keeping the driver’s eyes on the road. The exterior of BMW M760Li xDrive 2017 is identical to the regular ‘ole 7 Series. It has same proportions, character lines, and enormously long wheelbase. The difference is the Cerium Grey-colored trim. The front has a tweaked fascia with larger air intakes in the lower bumper, outlined in Cerium Grey. Cerium Grey can also be found complementing the glossy black in that characteristic kidney grille, which uses active shudders to either cool the engine or enhance aero efficiency. The new features also include the side-view mirrors caps and door handle trim and there’s discreet badging announcing the car’s cylinder count on the C-pillars. The rear end has a unique black surround for the exhaust, which uses an “exclusive V-12 geometry” for a dual-pipe, quad-tip look. The trunk handle strip was updated, and there are L-shaped LED taillights, and an M-specific rear spoiler. These entire features contribute greatly in making the model superior than the others. Beneath the hood of BMW M760Li xDrive 2017 stands the powerful 6.6-liter, twin-turbo, all-aluminum V-12 to produce 600 horsepower at 5,500 rpm and 800 nm of torque. It sprints to 62 mph within 3.9 seconds with the top speed 155 mph which is electronically limited. M Performance is aided with the eight-speed Steptronic Sport transmission for optimum shift patterns specific to the V-12. It offers zero converter slip outside of gear changes, and comes with Launch Control and a manual shift mode.